Umoya Energy – Hopefield Wind Farm, announced its support of Langebaan Primary School earlier this year, when it granted funds from a special budget, to fund the salaries of three teachers for the 2017 school calendar year. Teachers for Grades 1, 3 and 7 have been appointed on a 12-month contract post to help reduce the current strain on classroom learner-to- educator ratio, which averages a staggering 60 to 1 at present. This is twice the recommended target that the Department of Education has set out to attain. “The learner-to-educator ratio is the average number of learners per educator at a specific level of education, and directly affects the children’s ability to learn and generally thrive in a learning environment,” said Ryan Hammond, the Chief Executive Officer of Umoya Energy – Hopefield Wind Farm. This school, which accommodates over 400 learners from the local the community and surrounding towns, became a no-fee school four years ago. Desperate for additional teachers, the school applied to the Department of Education, but was declined, due to limited funds available in this District. “The school relies on fundraising to pay teachers’ salaries, which of course puts a strain on their administration,” added Hammond. “Umoya is committed to supporting education within our local community and the funding of the salaries of the additional three teachers is indicative of our ongoing commitment,” explained Hammond. 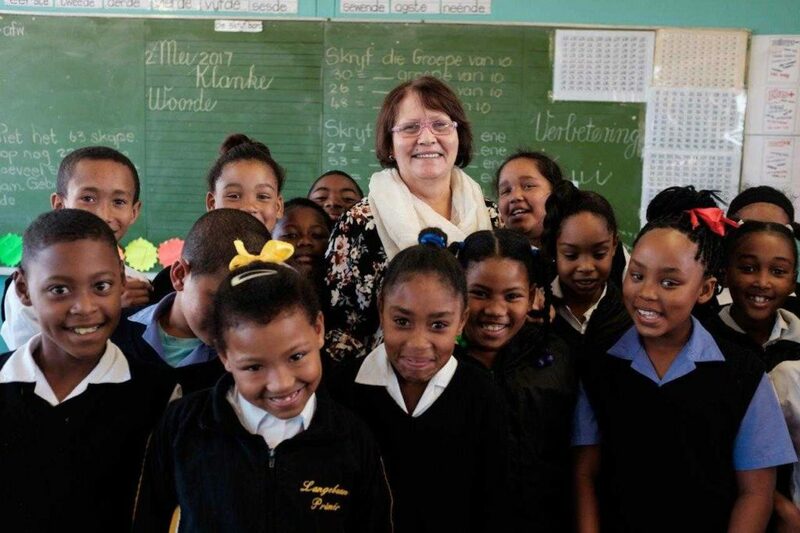 Umoya Energy – Hopefield Wind Farm, previously funded a teacher and classroom assistant at Hopefield Primary, to help reduce overcrowded classes and teacher workload. In addition to this, the Wind Farm is also often host to local community schools, assisting to supplement the school’s curriculum and classroom environment. “Hands-on exploration is a wonderful way for children to learn about Renewable Energy and in particular wind power, especially as the 95m high wind turbines have a lasting impression on the learners and teachers alike,” concluded Hammond. Umoya Energy – Hopefield Wind Farm, about 105 km north of Cape Town, has been operational since 2013. This 66 MW Wind Farm, comprises 37 wind turbines (Vestas), and is part of the Department of Energy’s first REIPPP Programme bid window. The wind farm is situated in the Saldanha Bay Municipality and generates enough electricity to power about 65 000 low-income homes, or 27 000 medium-income homes. Since beginning operations, it has turned its attention to optimising the operation of its power plant as well as implementing and supporting community projects in the Hopefield area. The wind farm spans 900 hectares, the majority of which is underlain by deep sandy soils which are vegetated with the Hopefield Sand Fynbos. The north eastern part of the site has previously been used for wheat production and only a few small patches of Swartland Shale Renosterveld remain. Hopefield Wind Farm addresses the ongoing and increasing need for electricity in South Africa and avoids approximately 183 200 tonnes of carbon emissions each year when compared to traditional fossil fuel power plants. Hopefield Wind Farm Local Community Company (a non-profit company) owns 5% of the wind farm.